Not content just to be the cheaper mid-size sedan on the market, the 2011 Hyundai Sonata, which debuted in Korea this morning, appears to be another vehicle from Hyundai ready to try and compete on more than just price. Though not quite as ridiculous as the awesome renderings, the Sonata is still one giant leap for Korean-kind over the current generation's attempt to be completely indiscernible from every other car in the market. The new interior, as well, appears to have skipped forward a few years over the current bland styling. 2011 Sonata, Rendered: Hottest. Hyundai. Never. The KDM version, pictured, will feature a diesel engine not coming anywhere near the U.S. market. Our version will start with the 2.4-liter Theta II GDI engine, which should offer more power, around 200 HP, and better fuel economy than the current generation. A V6 will surely be a part of the package when the Sonata drops in the U.S. next year. In addition to the new powerplant and revised aesthetic is a host of new or upgraded features, including Vehicle Dynamic Control, Hill-Start Assist Control, rear heated seats, and a host of other goodies. Prices in Korea will range from $17,600 to $21,450 USD. (Seoul, Korea) Hyundai Motor Company's all-new Sonata, being introduced today, is expected to shake up the world's mid-size sedan market with its daring design. The 2010 Sonata adopts Hyundais new "fluidic sculpture" design language, boasts outstanding performance with the segment-leading safety features and fuel efficiency. Incorporating state-of-the-art technologies, the new Sonata will further elevate the Hyundai brand. "The Sonata will set a new standard for world class mid-size sedans with state-of-the-art technology, superior build quality and emotional design," Euisun Chung, Hyundai's Vice Chairman said at the launching ceremony for the car today in Seoul. "The new Sonata will raise Hyundai's brand values." The ceremony, held at a trendy riverside cafe, was attended by more than 200 VIPs, company executives and media members. Hyundai began developing the new Sonata in 2005 under the codename YF (Note: The car may be launched under a different name in some regions). The project took 4 years and 450 billion won (US$ 372 million*) to go from concept to customer. Although it is a completely new vehicle, Hyundai is retaining the Sonata name as the mid-size car has been Korea's most popular sedan. Applying a new design aesthetic of "fluidic sculpture," the 2010 Sonata pursues a younger and sensuous image in its interior and exterior profiles. Inspired by nature, the "fluidic sculpture" tries to reflect sophistication and dynamism in the shape of the vehicle and will serve as the core of Hyundai's future design identity. The outer design of the new Sonata exudes a voluminous look that creates character through the refined and harmonized lines. The interior has a dynamic look that matches the exterior while not compromising comfort or convenience. The Sonata is available in nine exterior colors, from Remington Red to Blue Black to Espresso, satisfying the diverse tastes of younger customers. The new Sonata delivers powerful performance through its 2-liter Theta II MPi gasoline engine (Max output 165ps, Max torque of 20.2㎏·m). Delivering the highest fuel economy in its segment at 12.8 kilometers per liter, fuel economy is more than 11% improved compared with today's Sonata. Furthermore, all engines are offered with a new six-speed automatic transmission for heightened performance. To meet the most stringent automotive safety and crash requirements, the Sonata is built with hot-stamped ultra high-strength steel while featuring six standard airbags. In addition, safety has been upgraded with standard Vehicle Dynamic Control including Hill-start Assist Control and Brake Assist System functions?an industry first in this competitive segment. The new Sonata comes with a three-piece panoramic sunroof, giving a sense of openness and freedom as well as a stylish look. The Parking Guide System (PGS) allows drivers to avoid obstacles during parallel parking or when driving in reverse. The Dimension premium sound system offers high-quality sound in three types of modes to satisfy customers' wide-ranging musical tastes. In the new Sonata, Hyundai offers a wireless vehicle monitoring service?another industry first— through the Mozen Autocare service, linking the vehicle's electronic control systems to a monitoring center. The center checks various components for errors, informs the driver of the analysis, and provides directions to nearby service centers, saving time for drivers. Hyundai plans to sell 60,000 units of the new Sonata in Korea this year. Overseas, Hyundai will start production of the new Sonata at its Alabama plant early next year, while production and sales in China will start in early 2011. Hence, Hyundai expects to sell 450,000 units annually in all markets (Korea & overseas combined) beginning from the year 2011. In addition, Hyundai plans to present the gasoline version in January next year with a 2.4 liter Theta II GDI engine, which will be offered as a standard engine in the U.S. market. 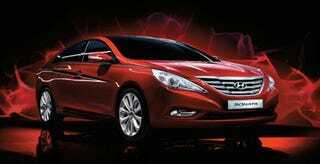 The new Sonata's price will range from 21.3 million Won to 25.95 million Won (US$17,600 to US$21,450). Hyundai is confident that the new Sonata, with vastly improved features, will attract and satisfy new as well as current customers. The added specifications are as follows: VDC, Electronic Parking Brake, Amplitude Selective Dampers, High Mounted Stop Lamp, Rear Heated Seats.